Our system consists of 22 Sanyo HIP200-BA3 200 watt photovolatiac modules, 2 Outback Power Systems GVFX-3648 inverters, 2 Outback Power Systems MX-60 charge controllers, and 8 Concorde PVX-2240T backup batteries. The roof mounted panels consist of two arrays. 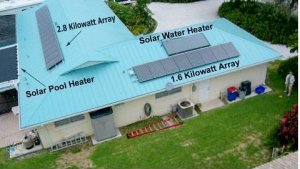 One 1.6 kw array faces south and the other 2.8 kw array faces west providing a total of 4.4 kw capacity. The batteries can power our emergency circuits for several hours insuring uninterrupted power to our lighting, computers, and refrigerators. mySolarLog.com is not responsible for the content of this User Description. bbbrown says: "Welcome to my mySolarLog site. Contact me using the e-mail link below:"